On August 27, 2002, the tribute album to the Pixar animated feature film Monsters, Inc., entitled Monsters, Inc. Scream Factory Favorites was released through Walt Disney Records. The songs on the album were recorded by American Western and comedy band Riders in the Sky, who started their relationship with Pixar after performing the song “Woody’s Round-Up” in the film Toy Story 2. The Scream Factory Favorites album featured songs based on the film, and the instrumental piece “Big High Wire Hop,” which was featured in the short film that premiered before Monsters, Inc., For the Birds. The album would go on to win a Grammy Award for Best Musical Album for Children at the 2003 Grammy Awards. Posted in Uncategorized and tagged 2000s, Grammy Award winning, Music, Pixar, Tribute, Tribute Album. Bookmark the permalink. On July 10, 1981, the tribute short film Once Upon a Mouse was released. A joint production between Kramer/Rocklin Studios and Walt Disney Productions, this short was released to honor the Disney Studios’ twentieth animated feature film. It is a mix of clips from Disney animated features, short films, and clips from Disneyland, showcasing Disney Studios from its early days to the status it had in the early 1980s. Posted in Uncategorized and tagged 1980s, Black and white, Color, Short film, Tribute. Bookmark the permalink. On May 13, 2008, the Disney tribute album Faith, Trust and Pixie Dust by Broadway singer and recording artist Kerry Butler was released through P.S. Classics. This album showcased Butler’s favorite Disney songs, along with two songs that were originally unreleased: “Call Me a Princess” originally intended for Aladdin, and “This Only Happens in the Movies,” which Alan Menken had written for Who Framed Roger Rabbit; this recording of the latter was its inaugural recording of the cut track. Butler’s ties to Disney also go back to 1995 when she played Belle in the Broadway production of Beauty and the Beast until 1997. Posted in Uncategorized and tagged 2000s, Album, Compilation, Music, Tribute. Bookmark the permalink. 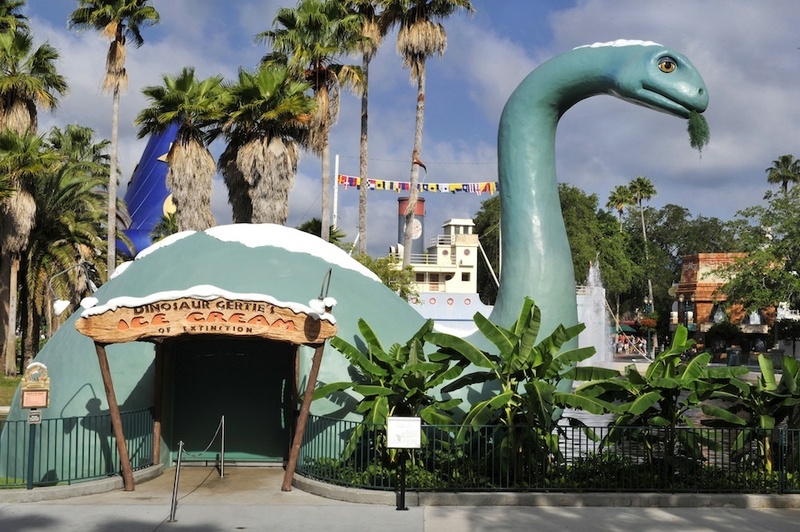 On May 1, 1989, the quick-service ice-cream shop Dinosaur Gertie’s Ice Cream of Extinction opened in Walt Disney World’s Hollywood Studios. The shop sells several well-known Disney park favorites, including a Mickey Premium Ice Cream Bar and a Waffle Cone. The shop was built as a tribute to Windsor McCay’s “Gertie the Trained Dinosaur,” one of the first popular characters in the history of animated film. Walt considered McCay and his creation to be pioneers in the field of the animated film. There are also dinosaur footprints in the concrete leading to the shop, attesting to the attention to detail each Imagineer brings to a project. Posted in Uncategorized and tagged 1980s, Disney Park, restaurant, Tribute. Bookmark the permalink.